“Standing Together to Organize a Revolutionary Movement (STORM), the revolutionary group formed by self-described “communist” and “rowdy black nationalist” Van Jones, held a vigil in Oakland, California, “mourning the victims of U.S. imperialism around the world” on the night after Sept. 11, 2001. “[Abstract]: One of the mysteries regarding Earth’s climate system response to variations in solar output is how the relatively small fluctuations of the 11-year solar cycle can produce the magnitude of the observed climate signals in the tropical Pacific associated with such solar variability. Two mechanisms, the top-down stratospheric response of ozone to fluctuations of shortwave solar forcing and the bottom-up coupled ocean-atmosphere surface response, are included in versions of three global climate models, with either mechanism acting alone or both acting together. We show that the two mechanisms act together to enhance the climatological off-equatorial tropical precipitation maxima in the Pacific, lower the eastern equatorial Pacific sea surface temperatures during peaks in the 11-year solar cycle, and reduce low-latitude clouds to amplify the solar forcing at the surface. [Text]: It has long been noted that the 11-year cycle of solar forcing is associated with variousphenomena in Earth’s climate system, in both the troposphere and stratosphere (1–9). 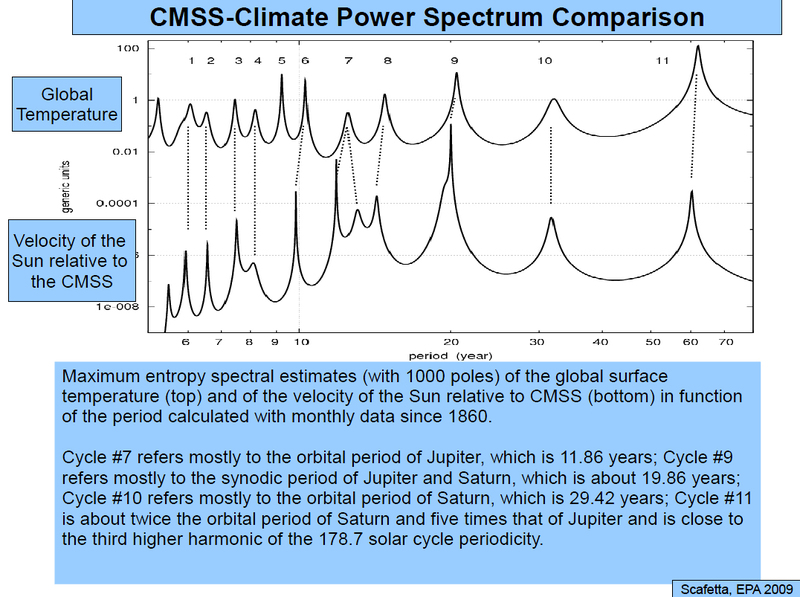 Because the amplitude of the solar cycle (solar maximum to solar minimum) is relatively small, about 0.2 W m−2 globally averaged (10), and the observed global sea surface temperature (SST) response of about 0.1°C would require more than 0.5Wm−2 (11), there has always been a question regarding how this small solar signal could be amplified to produce a measurable response. Postulated mechanisms that could amplify the relatively small solar forcing signal to produce such responses in the troposphere include changes in clouds in the troposphere caused by galactic cosmic rays, or associated global atmospheric electric circuit variations, though neither has been plausibly simulated in a climate model. However, there are two other plausible mechanisms, though each has not yet produced a modeled response of the magnitude seen in the observations. The first involves a “top down” response of stratospheric ozone to the ultraviolet (UV) part of the solar spectrum that varies by a few percent. Peaks in solar forcing cause the enhanced UV radiation, which stimulates additional stratospheric ozone production and UV absorption, thus warming that layer differentially with respect to latitude. The anomalous temperature gradients provide a positive feedback through wave motions to amplify the original solar forcing. The changes in the stratosphere modify tropical tropospheric circulation and thus contribute to an enhancement and poleward expansion of the tropical precipitation maxima (5, 12–16). The first demonstration of the top-down mechanism in a modeling study showed a broadening of the Hadley cells in response to enhanced UV that increased as the solar-induced ozone change was included (17). The meeting at one of the valley’s largest fruit packing houses came as federal attention has been focused this week on the water crisis crippling the region. A three-year drought, combined with environmental issues that have slowed water deliveries, have forced farmers on the valley’s west side to fallow more than a quarter-million acres. “It’s important for the secretary of agriculture to understand that California’s water system is broken and the federal government has a role in fixing it,” said [Rep. Jim] Costa [D-CA], who represents much of the region and has been on a nearly full-time mission to find a solution to the water crisis.